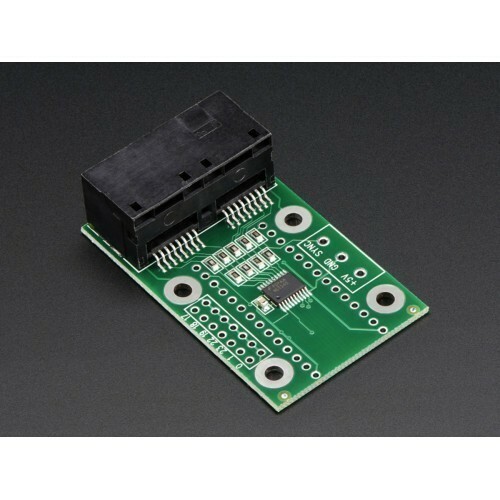 This adapter board connects the Teensy 3.1 to up to thousands of WS2811/WS2812 (a.k.a NeoPixel) and compatible LEDs using the OctoWS2811 Library. It features a 74HCT245 buffer chip and 100 ohm series matching resistors. A CAT6 Ethernet cable is used to connect this board to the LED strips. A CAT6 cable is designed for very high bandwidth, minimal cross-talk between twisted pairs, and 100 ohm impedance, for a very high quality signal. Teensy 3.1 is a small, breadboard-friendly development board designed by Paul Stoffregen and PJRC. Teensy 3.1 brings a low-cost 32 bit ARM Cortex-M4 platform to hobbyists, students and engineers, using an adapted version of the Arduino IDE (Teensyduino) or programming directly in C language.